What baking has taught me about love…. Every year, my dear friend Jessi makes Christmas cookies from scratch and provides an assortment and (keeping in mind which person like which cookie) its just as labor-intensive as it sounds. I have “helped” her do this exactly one time and that help pretty much consisted of tasting batter and entertaining her with stories and occasionally moving one dish from the table to the sink. Her love language is Quality Time so it works. Lo these many years, bemoaning my lack of ability to cook I allowed myself the use of premade cookie dough and occasionally would spoon it on to a cookie sheet (instead of my mouth) to “make cookies” for people I cared about. But over the last few years as I learned how to make cakeballs (to great compliment) so I can no longer say that I don’t know how to cook, I did attempt to find out how to make my Aunt Nancy’s cookies which is are known all over St Louis for being amazing. I watched her once and despaired I would ever figure it out. It is not that difficult, it simply takes effort which I recently learned is well worth the time to expend. Let me explain. 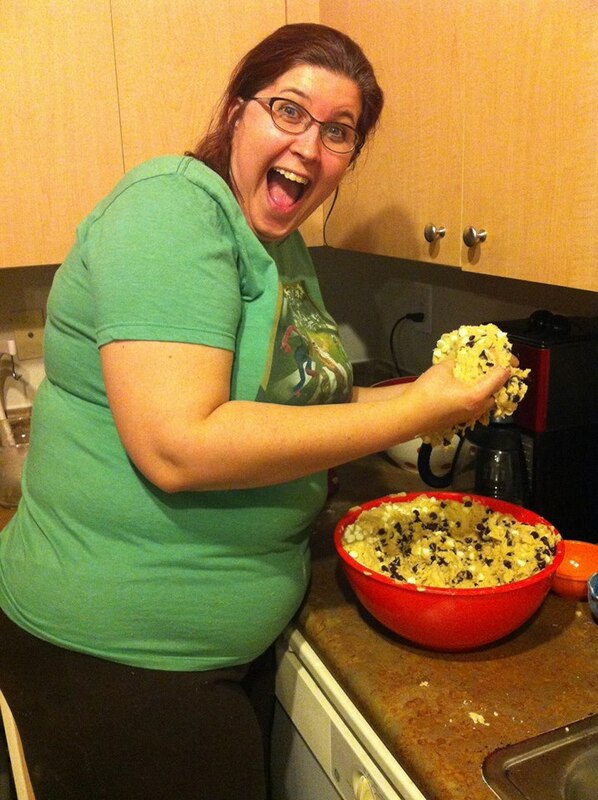 On Tuesday night, I hung out with my friend Meredith and amidst lots of time spent and grocery shopping we made over 100 cookies, some for the church, some for my team, some for the checker at the grocery store who took notice of us and said, “I want some cookies” so we brought him some. He was happy and surprised that we did. I was struck by how easy it is to take the shortcut and buy the premade dough and if you do this, I want to be clear, I am NOT judging you, as there is definitely something to be said for the sacrifice of time for convenience. The difference between the prepackaged cookie dough cookies and the homemade cookies you mix the flour, sugar, butter and chocolate chips is like night and technicolor morning! I had no idea the difference was so stark. The richness of the flavor, the sweetness of the chocolate chips each one melting in your mouth, absolute heaven! How does this relate to love you ask? Simple, we can love everyone the same, cookie-cutter emotions, words and ideas or we can choose to take the time, the effort, and the energy to find out exactly what the other person wants, needs, and desires. Yes, it takes time. Yes, it takes effort. However, the result you get is much like the difference between pre-packaged cookie dough and the cookies we painstakingly mixed, scooped, and baked the other night with the most important ingredient, LOVE. Think about it…. and Happy “baking”!! Next postCan you be happy for 100 days?